One of the easiest ways to ensure your product makes its rounds in the press is to give us something we haven't seen before. 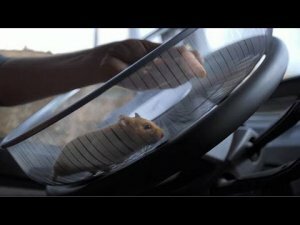 To show us, and the world, how easy it is to steer using the Volvo Dynamic steering system, Volvo Trucks decided to let a hamster demonstrate. The course is set on the narrow roads of the Los Tres Cuñados quarry in Ourense, Spain. The goal is the have the hamster steer the Volvo Dump Truck up the narrow roads using only a hamster wheel (for steering) and a carrot to control the hamster's direction. My guess is that everyone makes it to the top alive.